There I said it, I’m cheap, at least when I can’t go all in. Let’s face it, we can’t all have an enclosure with eight or sixteen blades in it as a home lab, and it would be nice to have at least 32 GB of RAM per host, well it would be down right nice to be able to have 64 or even 128 GB of RAM. But I can’t! Even thought I really would like to, having this kind of equipment at home, is too noise, expensive and would require a lot more maintenance, than I would have time to put into the lab. I think I have made it pretty clear, this lab isn’t going to dazzle anybody, but that’s the point. It doesn’t have to be enterprise grade – what ever that means. You can have a fully functional lab with less, there are of course compromise to make, but again that’s no different than working enterprise grade equipment. There is no red or blue pill that will show you the correct path, you have to find your own rabbit hole. And that is precisely why there are no one size fits all. Think of it this way, why are there so many different web servers out there. Why are we not all using IIS ? or Apache ? or Tomcat ? Well the simple trues is they serve different purposes. Back to the lab – And the hardware, which is some thing I got for free, second hand. It was to the previous own, garbage and was going to be thrown out. So that way I got two Dell OptiPlex 755, which was the start of it all. 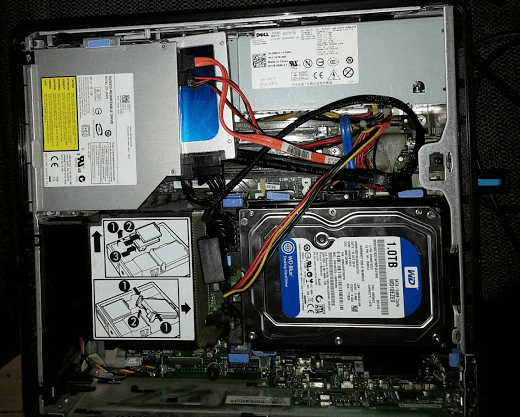 Quick specs for the OptiPlex 755 are, Intel Core2duo 2,3GHz, Max 8 GB RAM, 2 sata and 1 esata onboard via 82801R/IO/IH (ICH9R/DO/DH) which gets regonized as a 6 port sata controller (Will have to test that some day), 1 PCI slot and 1 PCI Express, and last Intel 82566DM-2 1Gbit Nic. So that biggest problem here is with out a doubt the maximum of 8 GB of RAM, which is not enough to have any fun really. Minimum requirement for vCenter 8GB RAM, for NSX manager 12GB, VCAC ID 2GB, VCAC Appliance 4GB, VCAC IaaS 6GB. So 64 or 128 GB would be lovely. That was the base config for the hosts, be sides that both hosts have an extra nic(Intel/Realtek – still haven’t looked at getting the Realtek to work), an Infiniband card have a look at Eriks or Vladans blog post about that. Lastly storage, I had to buy a HDD for the one host, and bought a WD Blue 1TB, mainly because of the price, but also for the larger cache, besides that I also bought two USB keys and two Crucial MX100, which have a fairly good performance consistency and have en endurance rating of 65GB/day for 3 years, which should be more than enough for this lab. All of this wouldn’t be that useful if I didn’t have some network devices, I gonna go over this quickly, as it is quite simple. For access, two layer two switchs, a Netgear GS108PEv2 (Needed POE ports) and a Netgear GS108Tv2 which is POE powered, and for layer three I’m using my Cisco ASA 5505. It hard to recommend any of these devices, but at least the ASA works consistently which is more then I can say for the Netgear devices. But they do support vlans, so that’s good. Currently the status, is that I have both hosts running, but still working on some small stuff, Nics, Infiniband, what to use the SSD for, lots of options, host cache(giving the lack of memory) , vsan (Need a host more), PernixData (Read/Write Cache) etc. also currently one of the sata connections is used for cdrom drive, and I’m still planning what to do with that, I’m guessing an extra SSD, host cache together some form of storage abstraction seems to be the best option, as memory IS the biggest problem. Is the 8gig the maximum of the motherboard or is it just what you have? We might have a few 2gig blocks at the office that we dont use. Thanks and thanks for the offer. But its maximum supported 🙁 its abit of a let down. But then even intels NUC or Apple mini “only” supports 16 GB and are a lot less flexible.